Audi Q3 crossover to be launched in June 2012! 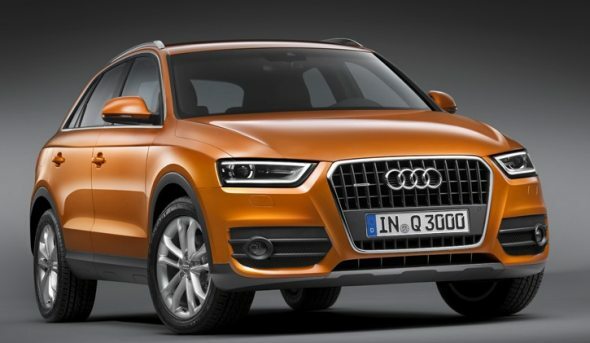 Audi India will launch the Q3 crossover in June 2012. The Q3 will take on the BMW X1 and is expected to be priced at around Rs. 25 lakh. In June 2012, the Q3 diesel will be launched with all-wheel-drive followed by the Q3 petrol version that will see the light of day in September 2012. The Audi Q3 has coupe-like styling and essentially bears an urbane character. The striking headlights and flat-set rear window lend a sporty appeal to the Q3. The Q3 is roughly 4.4 meters long, 1.8 meters wide and 1.6 meters tall; compared to its elder sibling Q5 it is just 20 cm shorter and 7 cm narrower. When compared to the BMW X1, the Q3 looks more SUV-like than a crossover. This may work well with Indian buyers who prefer SUV body types over crossovers going by sales figures. Audi will launch the Q3 with a 2.0 litre TFSI petrol engine and a 2.0 TDi diesel engine options. The 170 hp, 2.0 TFSI gasoline engine will be mated to a 6-speed transmission while the 211 hp, 2.0 TDI diesel motor will be mated to a 7-speed S-tronic transmission. The engines will produce torque ranging from 280 Nm to 380 Nm. The engine hood and wraparound tailgate are made of aluminum, which help keep the SUV’s weight under 1,500 kg. This will make the Q3 quick and fuel-efficient. Audi’s Q3 engines will be assisted by direct fuel injection technology, turbo, an energy recovery system, start-stop system to save fuel. Further, expect the top-end variants to come with four driving modes, comfort, auto, dynamic and efficiency. Audi Q3 will be loaded with lot of creatures comforts such as on-board computer with fuel efficiency program, sports seats, storage package, electrically adjustable and heated seats, start-stop technology, keyless entry, two-zone AC, ambient lighting package with LEDs, tinted rear windows, and 3-spoke leather wrapped steering wheel. The top-end variants of the Q3 will likely have large MMI navigation system, BOSE surround audio system and adaptive light (headlamps) technology. Audi is planning to assemble the Q3 at its Aurangabad facility by importing parts via CKD (Completely Knocked Down) route. Read more about the Audi Q7 here. Hence, expect the Q3 to be priced aggressively at around Rs. 25 lakh. The Q3 will squarely aim to dethrone the BMW X1 which is priced in the range of Rs. Rs. 22.40 lakh – 30.40 lakh.